Today’s Woman New England is a new television show created expressly to empower, educate, inspire, entertain, and unify women of New England. Produced by women, for women, and featuring women, Today’s Woman New England fuels women’s energies and connects diverse women to each other, and to local and regional resources and community to successfully manage multifaceted lives as caretakers, providers, and leaders. The show features local experts, civic and business leaders, and public figures in community and cultural organizations, and presents women-centric current affairs, life hacks, and personal profiles to inspire viewers to act and get involved in the issues that matter most to them. The pilot airs on Sunday, January 14 at 12:30 p.m., hosted by Caroline Elliott, and her guest co-host Shannon Moss, Maine Public Television’s host of High School Quiz Show: Maine. 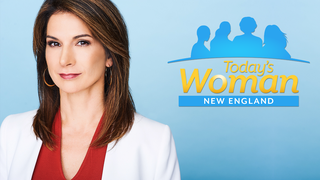 Styled after her successful cable series The Show and Tell Show, carried into more than 11 million homes nationwide, Today’s Woman New England is tailored to the New England public television audience. In each episode, Ms. Elliott and her guest co-host welcome expert guests from the region, and a three-person audience panel of New England residents. Spanning age, race, and beliefs, the revolving audience panel represents a cross-section of the television audience. In the first episode, panelists are (left to right) Rebecca Bakken, a writer and editor from Boston; Hume Johnsonof Cranston, associate professor of public relations at Roger Williams University; Carol Scalzo of Bourne, MA, entrepreneur and mother of two. Panelists share their opinions at the end of each segment, and provide their points of view on topics during a roundtable discussion at the end of the episode. 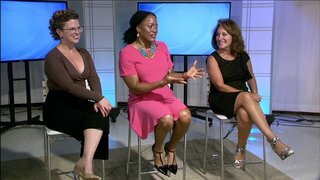 With thoughtful and thought-provoking interviews, dynamic demonstrations, opinionated discussion, and opportunities for viewer engagement, Today’s Woman New England addresses relevant and timely topics women juggle daily – health, relationships, parenting, work, style and beauty, cooking, giving back and more. Today’s Woman New England also profiles local “future leaders” - girls and young women making a difference in their communities. "Although we're all unique, many of our challenges, needs, and desires are universal," said Caroline Elliott, the show's executive producer. "By asking questions and sharing diverse voices, we create and elevate a supportive community of women who want what is best for their families and who also want to be their best for those around them." Community: Hosts and audience panel explore topics in popular culture, including a Glamour magazine/L’Oreal Paris study that shows women are 25% more confident than two years ago; workplace politics, and a new trend in perfume. Future Female Leaders: 19-year-old Natalie Meyer of Hinesburg, VT, founder and executive director of Refugee Outreach Club, with chapters in five high schools. Asked about her vision for the future of the show, Ms. Elliott said if the pilot makes it to series, she plans to host live events throughout the region, and partnering with regional community organizations of interest to women to support their events. Local events in each New England state may include panel discussions on current affairs, problem-solving presentations on timely topics, community service activities, professional networking receptions, as well as fun social events. “We are seeking to learn together, share together, build together, and help others together, in any way we can,” Elliott said. For more information about Today's Woman New England, including distribution, volunteer, and sponsorship opportunities, visit todayswomannewengland.com. After a decade working on the production and business sides of the television industry at MTV Networks and PBS, Caroline Elliott began working as a film curator and programmer to art museums and started a family. While homebound on maternity leave she was confounded by the absence of television programming that was relatable to today's multitasking real woman. She decided to create the show that she and others like her wanted: hosted by someone who understands the complex and multifaceted lifestyle of today's woman, providing the information we need to make life the best for our families and for ourselves, building community by sharing unique stories about other women juggling it all, and having fun along the way. Caroline Elliott is executive producer and host of Today’s Woman New England. She worked on the production teams of VH1’s Pop-Up Video, Storytellers, VH1/Vogue Fashion Awards, and The RuPaul Show before taking business roles at MTV Networks, PBS affiliate WXXI in Rochester, NY, and the Smithsonian. She earned her undergraduate and graduate degrees from Boston University. Committed to building a universal supportive community of women from all backgrounds, the mother of two also advocates for children, seniors, and animals.